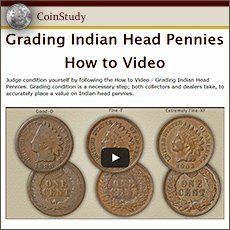 A close inspection determines if your 1901 Indian head penny value is above average. Most of these old pennies surviving today are heavily worn, finding one with the majority of the design remaining is worth double the others. Indian pennies began as finely detailed coins, the headdress and headband, curls and ribbon in her hair, all well defined. However, circulating in everyday use, wear from handing quickly smoothes and flattens the high points and finer parts of the design. Pictured is an "uncirculated" 1901 penny, there is no wear to the surfaces. Looking closely, all features are crisp and sharp. It is among these top condition coins value often reaches above $100. Many old coins, including yours, even if circulated and worn are often worth far above the minimum. The stages in wear as it relates to value are described with images below. 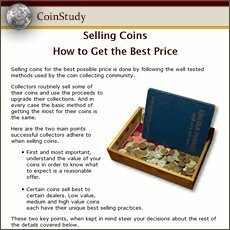 Comparing your coin to the images quickly gives a sense of its condition. For example, finding small details remaining within the feathers especially towards the tips indicates better condition. Collectors of Indian pennies are committed to adding quality to their sets. Nice, original honest coins are in the greatest demand. 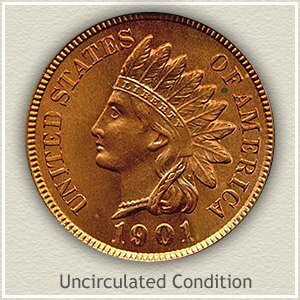 True, the highest 1901 Indian head penny value is awarded to those with no wear. Also true, lightly circulated examples are still very collectible. This coin is both above average in value because it is uncirculated and secondly above average within the uncirculated category. Considered by collectors as one of the top condition examples of a 1901 Indian penny remaining. As a result of active bidding at a David Lawrence Rare coin auction the final price was set a $494. Contrast that price to the average uncirculated price of $8 to $10. The coin pictured meets the minimum of having no wear to its surfaces but far exceeds in eye appeal. Bright original mint luster, no distracting marks or nicks and a bold well defined strike. While judging your coins, add pleasing eye appeal as an indicator pointing to above average 1901 Indian head penny value. Your coin does not have to be uncirculated, circulated copper coins turn various shades of brown some more pleasing than others. Your eye can pick out the nicer color, give these old pennies a closer look. With 1901 Indian head penny value rising quickly for better condition coins, accurate "grading" separates a coin worth a few dollars from the hundred dollar penny. Match your coin to the images and grading descriptions. Uncirculated: Desirable because no wear is affecting the surfaces. This penny despite its age is in like new condition. Toning may appear as a dark redness or brown on your coin, however no parts of the design have been worn from contact. With a magnifying glass examine her cheek and the tips of the feathers for wear. Minting imparts a certain grain to the surfaces of coins, wear can appear as a somewhat glossy or smooth area and sometimes with dullness to the area. 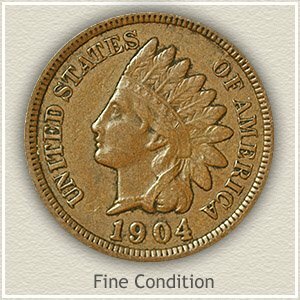 Fine: Separation of the major design elements are visible on 1901 Indian pennies in "fine" condition. The worn surfaces are evident but roundness defines the forehead from the eye and cheek. In the area close to the headband the quill and inner parts of the feathers are beginning to show details. Only the high profile ends of the feathers are worn lacking any design. Hair curls are recognizable behind the neck. These moderately worn 1901 pennies are highly collectible. 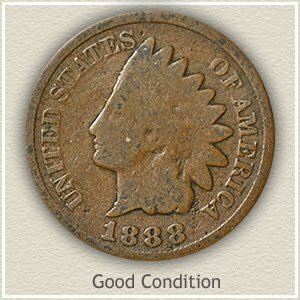 Good: A very worn coin but still recognizable as a 1901 Indian penny is referred to as "good" condition. Even at this low end of the condition scale the main design elements are prominent. Her profile is outlined with some detail separating her cheek and neck. Although very little of the headdress is visible, there is some slight roundness to the feathers. Traveling around the rim all lettering is visible, even if some are faint. Common dates are now worth one dollar each. You have a popular coin, everyone understands and has heard of the value of an Indian Head penny. Many collectors are building collections and putting a heavy demand on very rare dates and better condition coins. 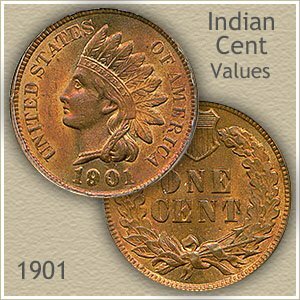 Compare your 1901 Indian head penny value to other dates on the values chart.